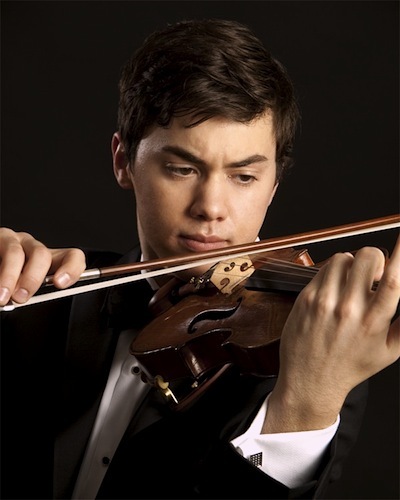 Violinist Benjamin Beilman opened the Los Angeles Chamber Orchestra's 2013-2014 season on Saturday at the Ambassador Auditorium in Pasadena, Calif., with performances of Mozart's Violin Concerto No. 5 in A major and Lutoslawski's "Chain 2." Beilman put his own, thoroughly convincing mark on the Mozart, adding a few of his own cadenzas to the traditional ones by Joseph Joachim and tweaking many of the bowings, articulations and technical habits we violinists have collectively formed in the 200+ years since this piece was written. This concerto has one of the most simple and effective openings in all the violin literature: After a long orchestral introduction, the violin enters on its most friendly note, an "A," slowly tracing "A" major chord as if to say, "I am the most beautiful instrument ever, am I not?" Ben, with his Antonio Gagliano violin (made in 1790, just 15 years after this piece was written) had me in complete agreement on this. Then came a little surprise, a cadenza of his own making, which brought us straight into the Allegro Aperto, which he played with bounce and vitality. Again, the first-movement cadenza was his own, and quite spellbinding. The second movement unfolded like one long, beautiful silken thread; Beilman was so fully present with his sound, 100 percent of the time. Not one note seemed inadvertent or glossed over. The music of Mozart, even in slow second movements, seldom takes the listener into realm of desperate sadness -- Mozart always rescues us short of the abyss. But Ben milked all the poignancy possible from those few moments when the music peers over the edge. He used Joachim's cadenza here, with its clever (okay, fun-to-play, IMO) syncopated double-stops. A Mozart violin concerto requires a small orchestra, and that orchestra often is formed by reducing the ranks of a larger orchestra. In this case, LACO already is a chamber orchestra, accustomed to behaving with the quick reflexes and smaller numbers inherent in that kind of group. Add Jeffrey Kahane's sensitive and adept conducting, and this allowed for a keen performance, with the orchestra responding with agility to the performer. The final movement had great energy and spirit of dance, and the famous switches between the proper Minuet and the snappy Turkish march were well-dramatized. Happily, Beilman was back right onstage after intermission to play "Chain 2," the 1986 work by the Polish composer Witold Lutoslawski, originally written for Anne-Sophie Mutter. This is precisely the kind of modern work that many people purport to dread, and yet it was clearly the highlight of the evening; it even earned a standing ovation. Kahane introduced the work with some words from the podium, explaining Lutoslawski's difficult early life: his father's death in Moscow by firing squad at the conclusion of the first World War, and then the composer's own POW experience during the second World War. Yet, "He never allowed his music to become autobiographical in any way," Kahane said. Fascinated with Cage's concepts of "aleatoric" or chance music, Lutoslawski experimented with introducing elements of chance into his works. Lutoslawski's "chain" concept involved writing strands, or links, of music that change from one to the other by overlapping, as in a chain. Some sections are ad-lib, within certain parameters; others stay within a strict beat. Of "Chain 2," Kahane said, "Every performance will be somewhat different, yet the sound is controlled by the composer." What could all this sound like -- a piece that hangs on a scaffold of randomness and freedom? 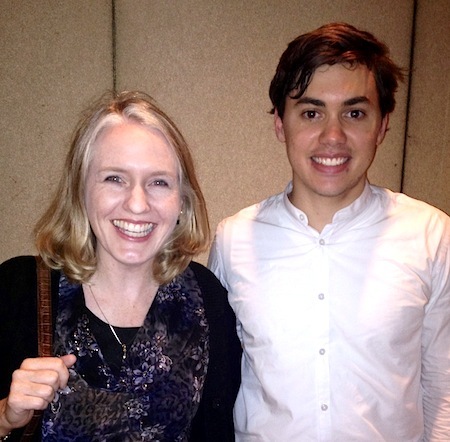 Well, there was nothing uncertain about it, from the perspective of an audience member. This performance had drama in sound and gesture. It had drive and direction. In certain places, it seemed to fit together like a puzzle, with moments of total precision. Then there were sections of sliding entropy: hypnotic, slow-motion cellos over a weird bell sound; or a section where everyone ascends as high as it seems possible, then stops into stillness. Or a loud mess of atonal chaos, where the conductor gives a signal and it all resolves -- sort of. But it all happened with a great deal of purpose. Meanwhile, the violin is very busy, very dramatic, channeling a great range of gesture and emotion. Like I said, the performance had people on their feet at the end. The concert was bookmarked with two pieces inspired by different kinds of dance: Beethoven's "Twelve Constredanses for Orchestra" (which includes an early emanation of the melody featured in the finale of the "Eroica" Symphony and other works) and Kodaly's "Dances of Galanta." Both pieces showcased what a lean machine is LACO, steering easily through abrupt changes of mood, sudden tempo changes and a lot of noodley notes. A pleasure to hear this fine group!